I have a race of octopodes with the same intelligence distribution as humans. I want them to “colonise” land to a similar extent as we have “colonised” space; have regular transport between the ocean and land, and have a permanent settlement. Ideally there would also be some form of EVA suit, to enable them to perform repairs on the colony - as we do on the ISS. Likely those who go to land would be the best of the best - just as we chose the best people to be astronauts. I have chosen octopodes because I am aware they can manipulate tools with reasonable fidelity, as humans can. So, the summary; would it be more octopus hours and to set up a colony on land as it was human hours to set up an international space station? 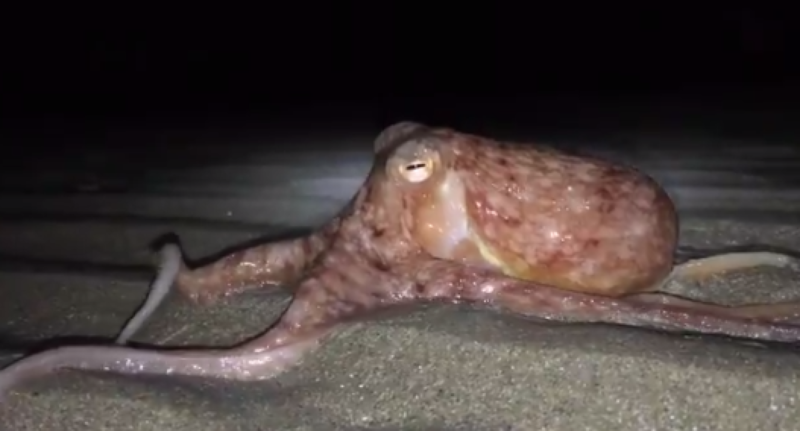 You can see octopodes crawl out of a tide pool and into a neighboring pool with little difficulty. octopodes have been known to crawl out of a tank in an aquarium and have the crab in the tank next door for dinner. They have even been known to shut off lights that bother them in their tank at an aquarium. They have been documented crawling out of their tanks, walking to a drain and exiting to the sea. I would definitely feel humans in space would have a much more difficult time at survival. Octopodes are not going to colonize land the same way we've colonized space - they're going to colonize the land the way we've colonized the sea. Penguino has done a pretty good of addressing how different it is for humans to go to space versus octopodes coming ashore. But there is a parallel that's much closer to shore (so to speak). An octopus' ability to survive on land is not that different from our ability to survive under the ocean, and in both cases there are resources that make it worth learning how to extend that length of time. You're not going to see ISS-like mobile aquariums as the early colonization steps. You're going to see irrigation, dikes, and dams, which turn formerly dry land into tidepools the same way humans carved Holland out of the sea. The earliest land-going octopus vehicles will be not be spacecraft or submarine-like - they'll be more akin to large bowls on wheels probably crank-powered (or oar-powered), given the difficulty they'll have domesticating any suitable pulling animal. They won't exactly be safe, but then again neither were the earliest boats. Entirely enclosed habitats won't come until much later, assuming they come at all. There's simply no need for them, and their construction complexity (and expense!) is much higher. Constructing water-filled environments for a water-breather to reside in on land isn't a significant technical issue. The manufacturing requirements for a salt water pool or aquarium are far simpler to achieve than for an air-filled canister to be used in a vacuum. Getting onto land from the sea requires enormously less energy than getting from the Earth's surface into space. So far: 2-nil to the octopodes. However, there appear to be significant barriers to the manufacture of metals and ceramics in a watery environment. Similarly, wet chemistry would be a lot more difficult, so it might be hard for the octopodes to develop even simple mechanical technology. A water-breather has a distinct disadvantage in manufacturing/using an EVA suit compared to an air-breather. Air can be compressed and is light. Water is in-compressible and heavy. So an octopus EVA suit would be very heavy and would probably need complex components to continuously reoxygenate the water. It is unlikely that such an EVA suit could be supported/manipulated by an individual octopus without mechanical assistance. So 2-all in the end. Easier to get there, simpler technology required for the environment, but harder to move around and possibly harder to develop even the simpler tech. But if the octopodes do already have a similar technology base to us, then it would be much simpler/cheaper/faster for them to reach land than it is for us to reach space. I would say that for both humans and your octopodes, Space is a much tougher frontier. Without going into the details, I would like to direct you to a few factors that may come into play. On another point, technology needed are an important factor. Note that the space suits required for humankind is much more expensive and technologically advance compared to a scuba diver's gear, space suits are whole other level.I would assume your octopus would have a similar comparison. ( The specifics of technology I will leave out as the price difference is clue enough.) The other thing is that space is a lot harder to get to than a place that is on your home planet. The very final point is most obvious. Space stations mimic the environments humans lived in on Earth. Your land colony for octopodes is probably going to be something along the lines of an aquarium tank scientified( That is not a word). Or a pool or lake. I don't "sea" that as very difficult at all. In fact, it is easier for Octopodes to colonize land than it is for humans to live underwater. Depending on the species, atmospheric pressure differences hurts creatures with air filled lungs much more than octopodes. I suggest you think your idea over a bit. May I suggest toughening up the environment on land compared to the sea? A more lifeless or hostile environment on land could bring the difficulty of a land colony closer to a space colony. If a tough colonization project is what you want your octopodes to go through. One major advantage that octopodes have in colonising the land, is that they can already make short stints out of the water without any specialised equipment. This is very much not true of humans in a vacuum. A question asked on Biology SE details the ability of an octopus to survive out of water, and another source details that coming out of the water to hunt terrestrial prey is common behaviour for certain kinds of octopus. What this suggests to me, is that given human level intelligence (maybe paired with a longer lifespan? ), octopodes would be well placed to begin colonising the shores. They probably wouldn't even need particularly advanced technology to do it. Your Octopods would have a much easier time because they have the advantage of being able to survive on land for short periods of time, better yet, they could remain partially submerged while working on land. As soon as an octopod figures how to reach out onto land and make fire, it's game on. From that point on, they'd be able to start to forge tools and make ceramics, et cetera. From that, they could dig into the land, flood areas, make networks of aquaducts, and move inland from there. Remember, they wouldn't even need suits in many instances, just access to water. Eventually, they'd build machines with the levers or buttons close to the aquaducts so they wouldn't even have to leave the water, just reach a tentacle out to operate it. So, the need for any suits to travel over land would be limited to maintenance crews and explorers, and some construction. I think a difficulty being overlooked (though not insurmountable) is that of building tools and vehicles from an underwater environment, at first limited to the resources available underwater. Easily manipulated materials like wood will be scarce. I suspect smelting, refining, etc. will be also infeasible. The same goes for baking clay or any other high-heat-dependent technology. I'm not even sure what's left that they can use to power their colonization efforts. With that in mind, I believe the colonization of land would have to take a few generations at least, occurring in tandem with the development of their civilization itself. I'd also expect they'd end up more proficient on land than in the sea even as unsuited to the environment as they are. Imagine if we tried to colonize space, we could get there just by jumping a few feet up, and we could also last about 2 minutes. But imagine all the natural resources were in space, nothing was here on Earth save a breathable atmosphere and food, combustion only worked in a vacuum, and heat would spread rapidly through our atmosphere so that we couldn't cook anything without also cooking ourselves. I believe the easier access to space would be heavily outweighed by the radically greater difficulty in developing any technology. It would be possible still (assuming we can come back from space rather than just float away). But we'd have to achieve most of our civilization's early accomplishments by working in space in very short bursts. Basic gathering would be simple enough, but not useful enough. Bringing resources back to Earth would not be very helpful if ore could not be refined in our atmosphere, metal could not be shaped, etc. And so it would be with your octopodes. I'd have a very hard time accepting as plausible any meaningful level of technology without having already established a land presence, and that technology brought into the sea rather than used to emerge from it. Not sure anyone has mentioned this but, lacking bones might be harder for a creature like the octopus to come up to land. With gravity movement might be significantly harder for movement as orientation is very different compared to water, also bones protect from impact, in water impact is less of a risk. Maybe that's worth considering when doing physically streneous activities on land. Not the answer you're looking for? Browse other questions tagged biology space humans underwater or ask your own question. What changes would be needed for humans to live in an ocean? What Adaptation Would Make An Octopus Live Longer? What is a realistic look for a humanoid race that can live in deep-water and land? Live Body Preservation…A way to live for many centuries?